From September 2017 Justin Miller takes up the role of Music Director, continuing a long history of association with St.Matthew's for the Chamber Choir where Justin is Director of Music. At St.Matthew's, Justin oversees the day to day running of the music department and directs the choir in all choral services at this famous parish church. He is also Specialist Music Coach for the David Ross Education Trust and works in schools throughout the town. He completed degrees at Westminster Choir College in Princeton, USA, and the Cleveland Institute of Music in Ohio, where his teachers included Ken Cowan and Todd Wilson. Justin was until recently Sub-Assistant Organist at Worcester Cathedral. In addition to his duties with the Cathedral Choir, he was Choirmaster of the Cathedral’s Voluntary Choir, both the oldest cathedral voluntary choir in the country and the last one to use only boy trebles. He previously held various positions at Blackburn Cathedral, St Albans Cathedral, Ripon Cathedral, and Winchester Cathedral. Whilst completing his MMus, Justin was Director of Music at Christ Episcopal Church in Shaker Heights, Ohio. As a soloist Justin has performed in numerous cathedrals, most recently Winchester, Hereford, Truro, and Worcester. In addition to his work as an accompanist, he has given performances of Rheinberger’s second organ concerto with members of the Toledo Symphony, and the Heights Chamber Orchestra. Justin is a hugely experienced choral director and we look forward to what he will bring to the choir. Northampton Chamber Choir has been performing in and around Northamptonshire, from where it draws its members, for over 40 years. 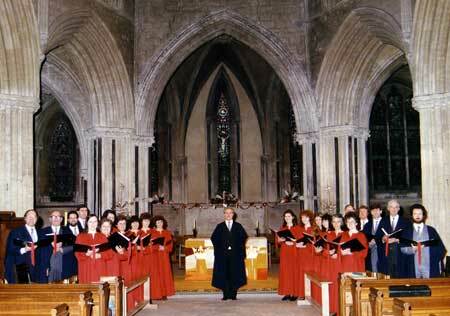 Its reputation was firmly established by founder conductor Stephen Meakins, under whose direction the choir was called the Laurence Lloyd Singers. Although a secular group, the choir has tended to specialise in unaccompanied sacred music and under Stephen's direction has sung in many churches and concert halls both locally and nationwide, and in a number of cathedrals round and about the country. The choir has always consisted of a mixture of students and older members and, regardless of changes over the years, the object has remained ever constant: enjoyment in making music together to a high standard in a convivial atmosphere. 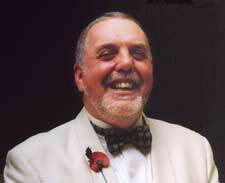 Stephen Meakins retired as Musical Director following the Christmas Concert in 2000. The Northampton Chamber Choir is born! 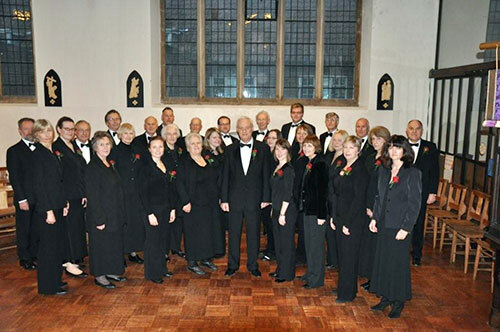 The choir appointed Stephen Bell as conductor in April 2001 and changed its name to The Northampton Chamber Choir. A very successful performance of the Mozart Requiem followed at St Giles Church, with the Northampton Guildhall Orchestra. 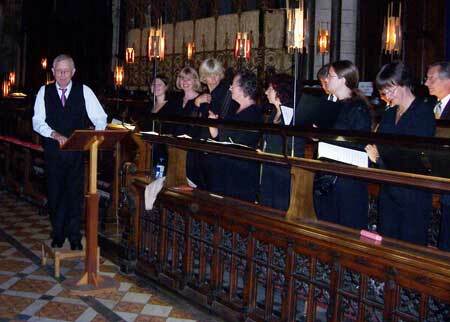 In April 2003 the choir was pleased to appoint Barrie Johnson as Musical Director. Under Barrie's leadership the choir enjoyed a major expansion of the repertoire and style of music, which broadened the choir's appeal to its audiences. Barrie is Head of Music at the Northampton School for Boys and brought experience of a wide range of musical tastes to the choir. The choir was disappointed when, in May 2005, Barrie found that his school commitments at NSB prevented him for continuing. When Robert Walker joined the Laurence Lloyd Singers as a teenager, he never thought he would return to Northampton over forty years later and be appointed its Musical Director! Although the name has changed, the choir is still going strong, with a couple of members who remember Robert's beautiful alto voice, before he left for Cambridge and a career in music that has taken him to far off places. Now a well established composer with a comprehensive catalogue of published works that have been commissioned, performed, broadcast and recorded by top orchestras and musicians around the world, Robert has returned to his Northamptonshire roots to live. Coinciding with Barrie's resignation, Robert Walker's return could not have been better timed for the choir. Robert is delighted to have the opportunity of conducting music from the wide repertoire of chamber choir pieces old and new, working with local amateur singers who thoroughly enjoy their music-making. He commented "It's a great joy to be in front of such an expert group of singers who get my jokes." Sadly, in September 2007, Robert's overseas commitments prevented him from continuing in his role as Musical Director. October 2007 - Stephen Meakins - Encore! Choir re-united with Stephen Meakins. However as one door closes another opens, or re-opens! 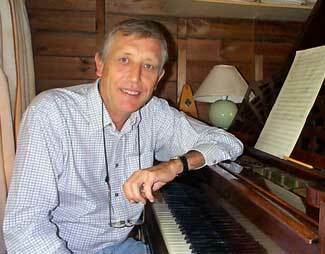 The choir was pleased to appoint Stephen Meakins as Musical Director in October 2007. The Northampton Chamber Choir had become a quite different Choir from the Laurence Lloyd Singers back in 2000, and Stephen enjoyed challenging the choir with a wide variety of choral music. Stephen Meakins rehearsing "The First Nowell"
Vaughan Williams "The First Nowell"
At the end of summer in 2011, Stephen felt it was time to move on and graciously pass the baton to a new Director (again!). The Choir was sad to see him go but, as always, we look forward to continuing to work with a variety of directors. Stephen at the organ in St.Matthew's. Stephen Meakins retired following the spring concert, the culmination of several succesful seasons, and was replaced by Stephen Moore. Whilst Stephen was in Northampton his main role was as Director of Music at St Matthew's Church, Northampton. His time at St Matthew's saw the premiere performances of several new commissions by the Church and individuals associated with the Church, as well as the production of two succesfull Choir CDs. Stephen also supplemented his work at St Matthew's with teaching at the Pitsford School and contributing to the Northampton Music and Performing Arts Trust, as well as a continuing involvement with the Royal School of Church Music. It's a wonder he ever found the time to attend rehearsals! Prior to coming to St Matthew's Stephen held the post of Organist and Director of Choral Music at Felsted School, Essex, as well as Musical Director of the Braintree Choral Society. 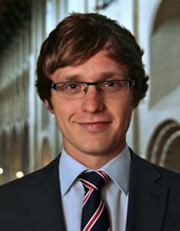 Stephen also spent two years working at the Royal Hospital Chelsea, having previously held posts at the Old Royal Naval College Chapel in Greenwich and Southwell Minster, and a year as Organ Scholar at Salisbury Cathedral, working closely with the cathedral choirs and playing for some of the nine choral services held in the cathedral every week! Stephen completed his undergraduate studies at Trinity College of Music, with organ as principal study, graduating in 2008 with a first class honours degree in performance and winning the Silver Medal for the highest keyboard studies mark in his year as well as the college prize for conducting. Whilst at Trinity he studied with William Whitehead and Colm Carey and twice won the Cardnell Organ Prize for outstanding performance. He is an Associate of the Royal College of Organists and a Fellow of Trinity College London. The Choir was very proud when after 5 years as their director, Stephen was appointed as the Director of Music at Llandaff Cathedral in Cardiff, Wales. This is a prestigious and exciting appointment for Stephen and although we were disappointed to see him go, we wish him all the best for the future. We've enjoyed some excellent concerts and challenges with Stephen, including music new and old (from current commissions right back to Tudor polyphony) and the odd cathedral evensong as well! The choir benefitted enormously from Stephen's dedication and fantastic keyboard skills and enjoyed many challenging and successful concerts under his leadership. The Choir was extremely pleased to welcome Edward Smyth as our new Music Director. Edward joined the choir as an experienced and versatile choral and orchestral conductor, who holds undergraduate and postgraduate degrees in Music from Durham University. He was a choral scholar at St John's College, Durham, as well as Director of Chapel Music at University College and Hatfield College; he also conducted one of the University's symphony orchestras. His concert repertoire has included works as diverse as Michael Tippett's "A Child of Our Time"; Leonard Bernstein's "Chichester Psalms"; and much of the standard symphonic repertoire. 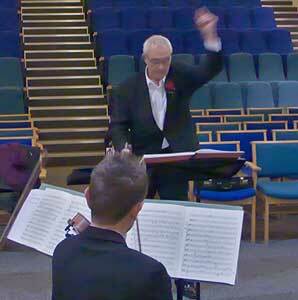 As a choral conductor he has led choirs in music of all genres, from early chant to modern show-tunes. Edward frequently acts as accompanist for solo recitals, and is the Ensemble Manager for the Oxford Bach Soloists - a professional group specialising in the cantatas of J.S. Bach, based at New College, Oxford. Aside from music, Ted is an acceptable squash player and truly dreadful golfer; enjoys cheap American crime fiction; expensive gin; and has now watched every series of The West Wing six times. Unfortunately, due to unexpected changes in class schedules, Ted had to leave the choir after only two terms, but we were sad to see him go - we'd never laughed that much in rehearsals and very much enjoyed the work we did to improve our overall sound. We look forward to collaborating with Ted again in the future if plans allow.